The ski resort Gresse en Vercors is located in the Arrondissement of Grenoble (France, Auvergne-Rhône-Alpes, Isère). For skiing and snowboarding, there are 20 km of slopes available. 10 lifts transport the guests. 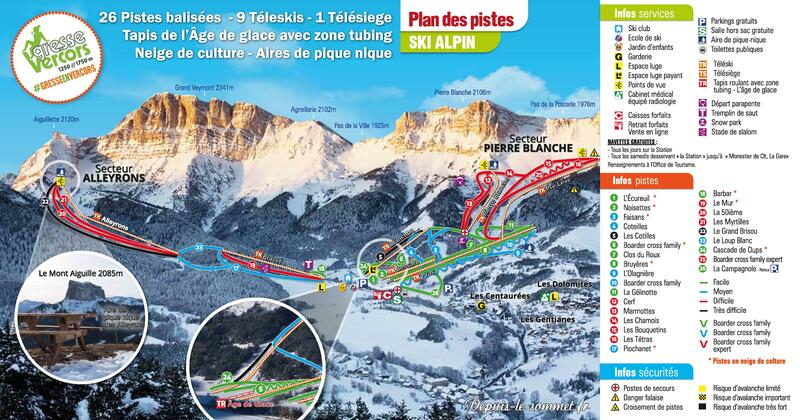 The winter sports area is situated between the elevations of 1,245 and 1,751 m.
The Gresse-en-Vercors ski resort is located within the Vercors Massif at over 1200 m. The Grand Veymont, which is the highest mountain in the Vercors, shapes the panorama. The slopes for skiing and snowboarding are mainly located beneath the treeline. In addition to Alpine skiing and snowboarding, there are also other winter sports activities offered at the winter sports resort including cross-country skiing, snow shoe tours and many others. Has the climate crisis and the higher temperatures affected snow conditions in Gresse en Vercors? For the last 5 years, week N/A has been the most insecure with N/A cm snow depth on average in Gresse en Vercors. Resort south of Grenoble. Sheltered slopes worth noting for bad-weather days.